Harcho is a tasty and a piquant meal. It is made almost like at home. Product consists of rice, potatoes, onions, tomato paste, beef, carrots and spices. Product is labeled with mark Green leaf and text “Without preservatives” because production process involves method of pasteurization just like home made. Therefore it means that after opening it should be kept refrigerated. Preparation: 3 – 4 portions from one jar. 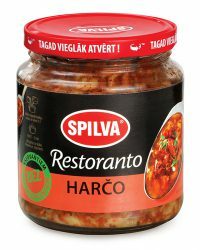 Mix the Spilva Harcho soup with water 1:1 and warm up for some 3 minutes. Eat with sour cream and greenery. Product is packed in 0,58 l glass jars. Shelf life non-opened – 24 months. Energy value: Per 100 g – 90,0 kcal (379,5 kJ) Nutritional value: Carbohydrates 13,9 g, Protein 3,2 g, Fat 2,4 g.